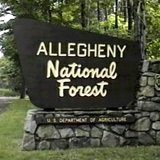 The Allegheny National Forest, Pennsylvania’s only National Forest, is approximately 517,000 acres and includes land in Elk, Forest, McKean and Warren counties in the northwestern corner of the State. About 463,000 acres are forested, 42,000 acres are non-forest, and 11,000 acres are covered by water (primarily the Allegheny Reservoir). The Forest features numerous recreational opportunities, including bicycling, fishing, hiking, horseback riding, picnicking, scenic driving and water activities. Come explore an enchanting world of towering rocks, deep crevices and passageways, cool, cavernous dens, and small caves! The rock formations are a unique outcrop of 300 million years old quartz conglomerate sedimentary rock that extend about half a mile and reach upwards of 60 feet tall – one of the largest of its kind in the world! Grotesque roots snake down the rocks and delicate ferns, mosses, and lichens add to Panama Rock’s unique, jungle-like charm. The park is home to 300+ year old hemlocks, and other species of venerable trees, including ash, beech, black cherry, elm, red maple, and sugar maple. The rock formations are surrounded by a one mile long hiking trail (self guided – off-trail exploring is allowed). The 805-acre Chapman State Park includes the 68-acre Chapman Lake on the West Branch of Tionesta Creek. Adjacent to state game lands and the Allegheny National Forest, Chapman is an oasis of recreational facilities in a vast area of wilderness. A sand beach is open from late-May to mid-September, 8 a.m. to sunset. 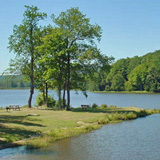 The 68-acre Chapman Lake has a boat launch and 41 seasonal mooring spaces on the western side. In 1859 Edwin L. Drake drilled the oil well that launched the modern petroleum industry. Drake Well Museum tells the story of the beginning of the modern oil industry with orientation videos, exhibits, operating oil field machinery, and historic buildings in a park setting. 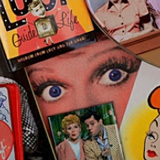 Visitors enjoy a variety of special events, educational programs, membership, volunteer, and shopping experiences on site. 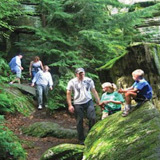 Recreational opportunities provide family adventure when combined with Oil Creek State Park bike and hiking trails which begin at the museum. 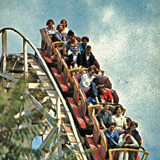 Picnic pavilions, fishing, and canoeing on Oil Creek, and a ride on the Oil Creek & Titusville Railroad are also available. The Warren County Fair is a great place to gather with your family and visit with your friends, both old and new. It’s a wholesome atmosphere that brings the community together for guaranteed fun and entertainment, suitable for all ages! Check the schedule for events including Go-Kart Racing, festivals, tournaments, craft shows, and more. 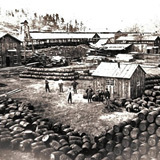 The Kinzua Viaduct, when first constructed in May 1882, was the highest and longest viaduct in the world, measuring 301 feet high and 2,053 feet long. The need to transport coal, oil and lumber across the Kinzua Gorge inspired General Thomas Kane, president of the New York, Lake Erie and Western Coal Company and Octave Chanute, Chief Engineer for the Erie Railroad to design a colossal viaduct. 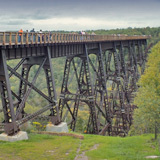 Today the Viaduct, has been reinvented as the Kinzua Sky Walk — a spectacular walkway that once again allows the public to “Walk the Tracks Across the Sky.” A partial glass-bottomed observation deck enables visitors to look down at the remaining towers supporting the historic structure. 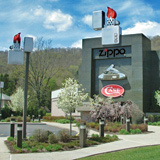 Come explore the 15,000 square foot attraction that includes the world famous Zippo Repair Clinic and Zippo/Case Store. Fourteen custom-made Zippo street lighters line the drive leading up to the building. Over the entrance towers a 40-foot Zippo lighter with pulsating neon flame, and an enormous Case Canoe three bladed pocketknife. Enjoy a self-guided tour to learn the rich history of two American icons.